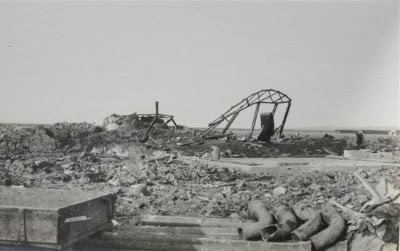 100 years ago today, on a remote coastline in North Kent, an explosion of unprecedented size took place. A single spark set in motion a chain reaction which caused the destruction of a munitions factory in a blast equivalent to 200 tons of TNT. At least 108 people died, many of them unidentifiable after the blast, and a crater 150 feet in diameter and 15 feet deep was left behind. The Great Explosion, as it became known, damaged windows in Southend and was clearly heard as far away as Norwich. And if it hadn't been a Sunday, when all the female workers had the day off, then then the outcome could have been considerably worse. 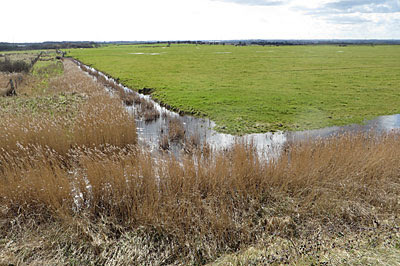 During World War One, the marshes north of Faversham were thought an ideal site for the manufacture of explosives. The town had a gunpowder industry going back centuries, and the water's edge was ideal for transportation. More importantly the marshes were almost entirely uninhabited should anything blow up, and there was plenty of space to spread out all the most dangerous activities. 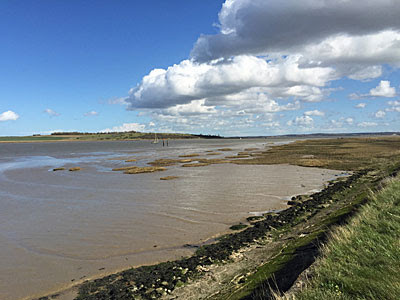 Two munitions works were established along a mile and a half of creekside overlooking the Isle of Sheppey, the largest being the Cotton Powder Company, its purpose to compress TNT into charges for shells, torpedoes and mines. Immediately nextdoor, on a smaller and more remote plot, were the premises of the Explosives Loading Company. And it was here, a few minutes after noon on 2nd April 1916, that a seemingly tiny fire caught hold. The source of the fatal spark was a boiler house with three lofty flues. A damaged inhibitor allowed it to escape, and the wind was in just the wrong direction to carry it fifty feet towards an entirely separate building. A heap of empty linen bags recently used for TNT were resting against the matchboard wall of Hut 833, which caught fire and started burning at one corner. The Clerk of Works raised the alarm, and the assistant manager took immediate steps to douse the flames by means of a hose and fire buckets. But by the time the general manager had returned from lunch the fire had taken hold, and he made the decision to try to remove as much of the explosive as possible rather than ask everyone to flee. Had only TNT been present then no disaster would have occurred. Unfortunately a considerable amount of ammonium nitrate had recently been unloaded, and several tons were lay in and around the hut in direct contravention of safe practice. These days a risk assessor would have banned the situation outright, but this was wartime, and the government deemed mass production more important than following every small rule. The perfect ingredients to create high explosives had been brought together, and at 1.20pm the contents of the building duly detonated. The manager had just given the order to withdraw, but of those congregating nearby very few escaped death or serious injury. Almost simultaneously, 120 yards away inside the grounds of the Cotton Powder Company, two buildings containing nitro-glycerine blew up in sympathy. As the flames burned, the concussed general manager summoned medical assistance before returning to join those attempting to prevent the fires spreading. Two further buildings exploded, at twenty minute intervals, increasing the death toll still higher. Only some heroic action from the survivors prevented a fire on the roof of a neighbouring magazine taking hold, which the government report following the tragedy said would have been just enough to detonate the CPC's damaged guncotton stoves, increasing the destruction still further. 69 victims of the Great Explosion were formally identified, all of them men, while a further 36 were "accounted for other than by identification". A mass burial was held at Faversham Cemetery a few days later, with the committal service overseen by the Archbishop of Canterbury. The King and Queen were "deeply grieved to hear of the disastrous explosion" and joined in the "universal sympathy which will be felt for those who have lost relatives and friends". And although the Explosives Powder Company had been rendered entirely inoperative, production continued at the Cotton Powder Company as best it could, because there was a war on. 100 years later, you'd barely guess such intensive industry was ever here. The docks have vanished, with only a couple of overgrown stubs of jetty stretching out from the seawall to the creekside. The wartime railway built to ship in workers from Faversham has disappeared, bar one road tunnel, with horses now in control where the terminus station used to be. 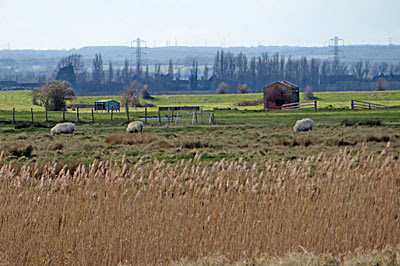 Most of the Cotton Powder Company's land has become the Oare Marshes nature reserve, a watery enclave for copious breeds of waterfowl. The remainder is now farmland, a swathe of marshy pasture for sheep and cattle, amongst which a few scattered foundations and concrete piles remain. As for the Explosives Loading Company, almost nothing is left, as you'd expect, and even public footpaths give this brackish grazing land a miss. Normally you can't get close to the epicentre of the explosion, but this week the farmer has opened up a private track to allow at least some access to the disaster zone. A brilliantly-realised heritage trail leads off from the farmhouse in the hamlet of Uplees, with a series of illustrated information posts bashed into the ground at key points round the circuit. Laminated for protection against the weather, they tell the story of that fateful day and, more importantly, allow you to see what used to be here before the cows came. Magazines for the blending of cordite, the remnants of a glycerine press, even the concrete footprint of the office building from which operations were run, can still be vaguely distinguished. You need an aerial view to properly see the regular patterns made by the remaining foundations, but the photos of flat-capped workers and austere huts around the trail do a wonderfully evocative job. As for the site of Hut 833, that remains strictly off-limits. You can get within half a mile on this week's 'Explosives Walk', with a sign directing you to look towards an insignificant redbrick shed in the middle distance. Or you can walk a little further along the seawall, to where the marshes open out, and try to spot the same building on the far side of the field. You'd never know, if simply walking by, that over a hundred people died across this pastoral scene. Various commemorations are being held in and around Faversham today, including a service at the cemetery and an exhibition at the church, or you can come for afternoon tea at the farm cottage in Uplees. I doubt it'll be as quiet as usual at the former cordite factory today, but then it wasn't in any way quiet on that fateful Sunday a century ago when a single spark caused carnage, and heroism met tragedy.